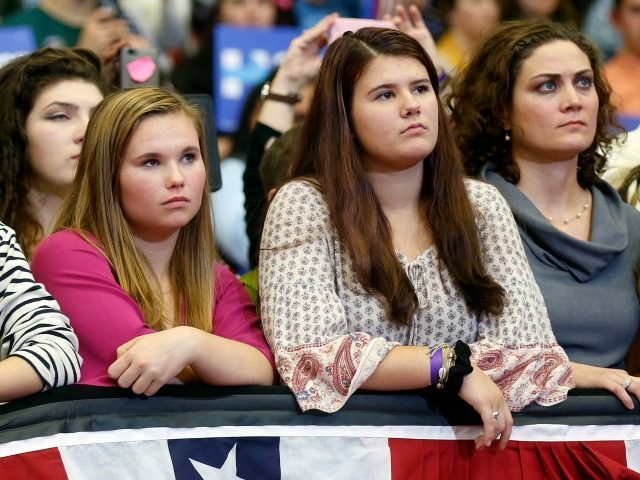 The number of women in part-time jobs has doubled in the eight years of President Barack Obama’s tenure, because his management of the economy has produced very few new full-time jobs, according to a new report by left-wing academics. From 2005 to 2015, the percentage of men in “alternative work” increased modestly from 12.3 percent to 14.7 percent; but the percentage of women in alternative work almost double from 8.9 percent to 17.0 percent, according to President Obama’s former Chairman of the Council of Economic Advisors, Alan Krueger. Essentially, nearly all of the jobs created in the last decade were not traditional nine-to-five jobs, the report showed. Krueger co-authored the report for the National Bureau of Economic Research, and showed how found the percentage of American workers employed in “alternative work,” an economist’s polite term for part time and temporary help, jumped from 10.7 percent to 15.8 percent between 2005 and 2015. In grim news for millennials taking on huge loans to attend college, since 36.3 percent of individuals involved in alternative work are college graduates with 4-year and advanced degrees. Given that females now account for 57 percent of college students, the percentage of women losing full-time employment opportunities is set to rise in the future. Also, millions of prime-age men have been pushed out the workforce by government policy, according to the current chairman of Obama’s economics panel. That trend leaves a greater burden on women in their lives, including mothers and wives. Simultaneously, Obama has ramped up the annual inflow of foreign contract-workers and immigrants to take many jobs, putting more stress on American men and women. Krueger acknowledged that the survey’s original goal was to quantify the size of the gig economy that amounts to about 0.5 percent and growing, but they were stunned by the tremendous growth of alternative work. The percentage of women with job rose steadily from 32 percent in 1948 up to 73 percent in 2005. But in the last decade, as “alternative work” rose dramatically, the percentage of women working has trended down to 69 percent. From 1995 to 2005, the percentage of U.S. workers involved in alternative work was stable, partly because of many full-time professional and construction jobs. Those jobs are mostly filled by men, so percentage of men in alternative work in 2005 was just 12.3 percent. That percentage was higher than women’s alternative-work rate of 8.9 percent before 2006.